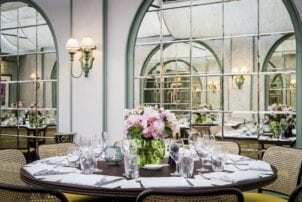 The elegant surrounds of the Daphne’s conservatory can accommodate up to 40 guests for a private lunch or dinner and is licensed to host wedding or civil ceremonies. In summer, the bright conservatory creates an alfresco feel; in winter a blazing fire in the open range turns it into an intimate retreat. Head Chef, Mike Brown creates seasonal menus especially for private events in the conservatory that highlight the best of each season’s produce.